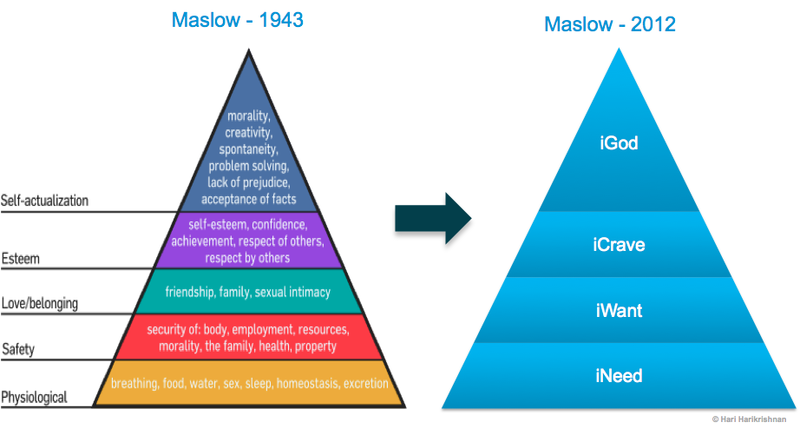 The Pyramid of Human Motivation introduced by psychologist Abraham Maslow in 1943 is a marvel, without which we would have had to look to spiritual gurus to find meaning of human motivation; we would have needed other frameworks to arrive at employee compensation; we would have no basis for reward systems. No easier way to instill motivation itself perhaps. Here is a 2012 toast to Maslow — an infographic that interprets Maslow’s hierarchy of needs with a contemporary twist. The attributes of self-actualization — lack of prejudice, acceptance of facts etc. — seem godly characteristics that call for a mapping to a suitably named iGod tier. (Picture on the left is courtesy Wikipedia). So where would we place an iPad or iPhone on this hierarchy of needs? After I posted this article, I came across Apple’s statements in the past that suggested that “iPhone was just below food and water on Maslow’s hierarchy of needs“! Another writer had a similar theme: Do you really need an iPad? I am inclined to place the iPad in the iCrave tier. On the other hand, if one believes that internet access has come to be a human necessity, as I casually suggest here, they may place it in the iNeed tier. Where would you place iPad in this hierarchy of needs?